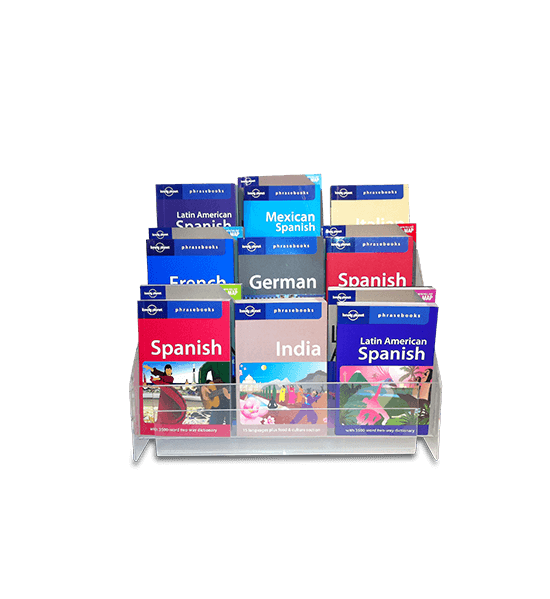 Countertop display for lonely planet books. Lonely Planet is the largest publisher of travel books on the planet. I first used their guide to backpack through India in 1982 during my ill-spent youth. But I digress. Lonely Planet wanted to develop a countertop travel guide display and needed it to be custom-sized for nine of their popular titles. Three tiers and three rows later, the display was packed and shipped to the stores. The tier-to-tier spacing, width, depth and height were all optimized for maximum product placement in a minimum space. We stuck with clear acrylic so there was nothing about the display to detract from the covers depicting beautiful photos from all over the world. The compact display size and product density allowed premium counter placement in the retail stores. The display returned on its investment in four months with increased sales and profits. Truly an epic journey.